System Architecture Evolution (SAE) is a new network architecture designed to simplify LTE networks and establish a flat architecture similar to other IP based communications networks. SAE uses an eNB and Access Gateway (aGW) and removes the RNC and SGSN from the equivalent 3G network architecture to create a simpler mobile network. This allows the network to be built with an “All-IP” based network architecture. SAE also includes entities to allow full inter-working with other related wireless technology (WCDMA, WiMAX, WLAN, etc.). These entities can specifically manage and permit the non-3GPP technologies to interface directly with the network and be managed from within the same network. The EPC is a key part of SAE. 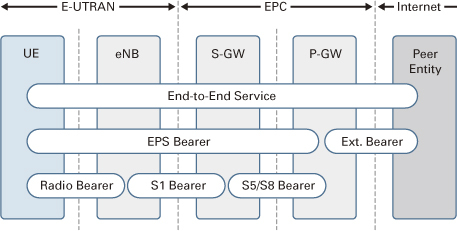 Major subcomponents of the LTE EPC include the MME, SGW, and PGW. When the signaling of Non-Access Stratum (NAS) terminates at the MME, it generates and allocates temporary identities to UEs. Then, it authorizes the UE for the Public Land Mobile Network (PLMN). It is also responsible for the enforcement of UE roaming restrictions. The MME handles the ciphering/integrity protection for NAS signaling and the security key management. It supports lawful interception of signaling, and the control plane function for mobility between LTE and legacy networks with the S3 interface. The S6a interface connects the MME to the HSS for roaming UEs. SGW (Serving Gateway):The main function of the Serving Gateway is routing and forwarding of user data packets. It is also responsible for inter-eNB handovers in the U-plane and provides mobility between LTE and other types of networks, such as between 2G/3G and P-GW. The DL data from the UEs in idle state is terminated at the SGW, and arrival of DL data triggers paging for the UE. The SGW keeps context information such as parameters of the IP bearer and routing information, and stores the UE contexts when paging happens. It is also responsible for replicating user traffic for lawful interception. 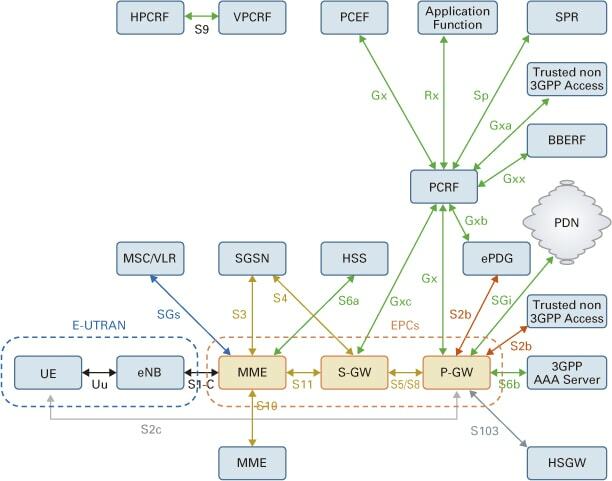 Another important role of the PGW is to provide mobility between 3GPP and non-3GPP networks. For example, mobility between WiMAX and 3GPP2 or between CMDA 1X and EVDO are supported by the PGW.